At a City Planning Commission (CPC) hearing last December, developers of the Wilshire Grand project downtown raised no objections to planning department recommendations greatly scaling back hundreds of thousands of square feet of electronic signage that many believed would have created a Blade Runner-esque style atmosphere on what is proposed to be the city’s tallest building. Despite their silence at the hearing, where the CPC approved the recommendations, the project developers have now appealed that action to the City Council, seeking to restore much of the signage that has raised concerns about light pollution and potential distraction to drivers on the Harbor freeway less than a block away. The council’s Planning and Land Use Management (PLUM) committee is scheduled to consider the project, including the signage appeal, this coming Tuesday, Feb. 22. The developers, Thomas Properties and Hanjin International, are seeking to restore more than 20,000 sq. ft. of electronic off-site advertising signage for the project, which consists of a hotel, condominiums, office space, and shops and restaurants. 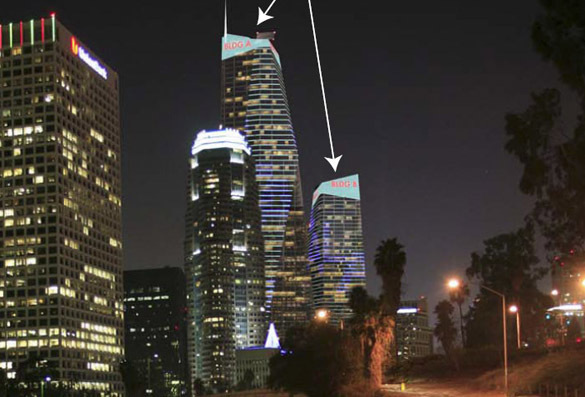 The appeal also seeks to reverse the CPC‘s disapproval of changeable electronic lighting built into the facades of two towers, 65 and 45 stories, respectively. If the PLUM committee grants the appeal, the entire matter would have to return to the CPC before a final vote by the City Council, which is now scheduled for March 9. Below are the major differences between the CPC action and the signage sought by the appeal. 1) The CPC disapproved of any electronic lighting or signage between the building’s podium, or approximately 150 ft., and the top of the highest of the two towers above, at more than 1,100 ft. The developer had originally proposed electronic signage with off-site advertising on 40% of the façade, and the planning department had recommended “architectural lighting” only, with elements at a minimum of 12 inches apart. The developer’s appeal seeks to restore the architectural lighting without advertising text or logos, but with a separation of only six inches between electronic elements. The lighting would be allowed to change colors at various intervals on different parts of the façade, ranging from intervals of two minutes to six hours. The lighting would be required to remain static between the hours of 2 a.m. and dawn. 2) The CPC approved three electronic signs that could display off-site advertising, one of 3,000 sq. ft. , one of 2,000 sq. ft., and one of 1,200 sq. ft., all limited to being 20 ft. high. The appeal seeks three signs of 16,000 sq. ft., 8,000 sq. ft., and 4,000 sq. ft., respectively, with no vertical limits. This increase totals 22,300 sq. ft., or 360 per cent more than approved. 3) The CPC approved 10 ft. high scrolling electronic news ribbons in three locations that could display 1,350 sq. ft. of off-site advertising. The appeal seeks to extend these ribbons to allow a total display of 3,600 sq. ft., or an increase of 160 per cent. 4) The CPC disapproved of any supergraphic signs. The appeal seeks approval of an unspecified number of supergraphic signs, each sign not to exceed 300 sq. ft.
At the CPC’s Dec. 16 meeting, several representatives of the developers-Thomas Properties Group and Hanjin International—spoke in general terms about the building’s signage, but never raised specific objections to the planning department’s recommendations, leading some to assume that they were in agreement with scaling back the amounts originally proposed. This assumption was obviously unwarranted, given the filing of the appeal to be heard by the PLUM committee. During the CPC hearing, the chief city planner in charge of the project, Kevin Keller, said that the recommendations were in response to concerns about the unprecedented quantity of the electronic signage, as well as concerns by the city’s Department of Transportation (DOT) about signage visible to motorists on the Harbor Freeway and on the major city streets surrounding the project site. CPC president Bill Roschen argued against allowing the electronic “architectural” lighting on the two towers, saying that it could significantly alter the appearance of the downtown skyline. For more, including a simulation of what the advertising on the signs might look like, see this Curbed L.A. article.